The authors of Crooked Cat, publisher of my romance with a difference: Neither Here Nor There, are holding a six-week extravaganza of stories, poems, free giveaways and more, called: CHANUKA WITH THE CROOKED CATS, or something like that! In honour of this unique event, I am publishing, here on my blog, my Christmas story with a difference. The story clearly takes place in a year that isn’t this year, because this year Chanuka ends on Christmas eve, whereas in the story there is a gap between the end of Chanuka and the beginning of Christmas. If you want to discuss anything in the story, you’re welcome to do so in the comments below. Please comment promptly because I’m going away in a few days and might not be available to respond. 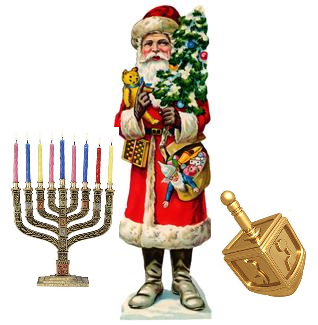 By the way, while there are about fifty ways of writing Chanuka in Latin letters, there is only one in Hebrew: חנוכה. Everything I hear and everything I see seems to have something to do with Christmas. On the TV and the radio, and in magazines. Everywhere. They talk about it and sing about it and have pictures about it. I think it’s boring. When I turned on my favourite TV programme – Doctor Who – and found that was all about Christmas, I was so fed up that I actually switched off and even read my library book instead. At school, we only talk about Christmas a bit of the time. Keith said we must never write Xmas, even though it’s easier to spell. That’s because the X stands for the cross and we don’t believe in that. Keith was also the one who told me I must never look for a rainbow in the sky when it’s raining and sun shining at the same time, because I don’t know the brocha for it. I think that’s a shame because rainbows are pretty and it’s nice to look at them. I’ll have to find out what the brocha is and memorise it. It’s probably something like, “Blessed art thou, O Lord our God, for giving us the rainbow.” I wonder how you say rainbow in Hebrew. On Tuesday, when Mummy took me home from my piano lesson, it was dark. On the way back from the bus stop, we passed three houses with lots of little flickering lights. I knew what they were. Christmas again. “Why do people have Christmas trees?” I asked Mummy. Well, that’s true. I love all the singing and dancing in shul. And I love dressing up on Purim. I suppose what I meant was that I want to have fun now. The next day, I met my friend, Johnny, in the street. I like Johnny because he’s only six and I’m seven, so I can tell him things. Once, I told him how many more Corn Flakes coupons he needed before he could send away for a football, because he didn’t know how to work it out. And another time, a big boy walked past us and Johnny wanted to know what it said on his shirt. “It said, ‘I came on Laura’,” I told him. “Who’s Father Christmas?” It wasn’t that I hadn’t heard of Father Christmas. But I never really took much notice before. I didn’t know there were special deer that came out in the rain, but I didn’t like to say I didn’t know that, either. It didn’t seem bad to me to have fires burning. Especially if there was ice and snow there. Still, I punched Johnny in the tummy. Not a real punch – just a pretend one. “I’m good,” I said. We played outside for a while, taking turns to ride my new scooter, which I got for Chanukah. It was while I was running after Johnny that I saw something small and flashy on the pavement. I stopped, picked it up and started to examine it. Johnny soon came back. “Hey! Why did you s…,” he started. Then he spotted my prize and his eyes widened. “My dad’s got one of them. It’s a cigarette lighter.” This business of Johnny telling me things was getting to be a habit I didn’t care for. “Try pressing that button quickly,” he said. “Can I have it?” Johnny asked. “No. I found it.” I put it into my pocket – after letting go of the button, of course. Afterwards, on my own in my room, I decided to experiment with the lighter. The first thing I tried it on was my counterpane and… well, I decided not to try it out again, although it made a nice smell. I hope Mummy and Daddy don’t notice that pretty hole in the counterpane with the black edge. I wonder if Santa ever burns holes when he lights his fires. Anyway, while I was doing that, I thought about what Johnny had said about Santa giving out presents only to good children and all that. Maybe we were bad because we didn’t have a Christmas tree and that was why Santa didn’t bring me presents. “How do you spell Santa?” Spelling is my thing at the moment, and I bet Johnny doesn’t know how to spell it. “How d’you do that?” I asked. So when I was in bed, thinking about Santa, I wondered what the letters S-A-N-T-A could make. But I think I fell asleep without thinking of anything. When I woke up, I knew Santa was bad. I don’t know why – I just knew it. And I decided I had to tell Johnny about him. I was hurt. I wasn’t being naughty at all. I was being good and teaching Johnny something he needed to know. After Johnny left, Mummy called me into the kitchen. I sat on the stool. She sat next to me on the folding chair and I saw the frown that always makes the wrinkles round her eyes show up more. It makes sense, I suppose. It would be confusing for Johnny if everyone told him different things. He wouldn’t know what to believe. So, for now he’ll carry on believing he gets presents from a man who lights fires to keep warm in the snow and ice, and is pulled along by deer that come out in the rain. All this makes me wonder whether grown-ups have told me any lies. I wonder about the tooth fairy. And about Haman, the wicked man who wanted to kill all the Jews on Purim. There couldn’t really be someone who wants to kill all the Jews, could there? To see all the other Crooked Cat stories, poems, giveaways and more, join our Facebook group. Neither Here Nor There, my romance with a difference, is available from Amazon, Crooked Cat Books, Smashwords and The Book Depository. Lovely story. Rather ironic end. You have the child’s voice very well. But I don’t think it’s a story just for children – or even for children. I don’t think so either. Glad you like it. Really charming but …makes the reader think too. Great combination. Ah, the last line was one of the criticisms when I sent this story somewhere once. They thought it didn’t fit. Oh no the last line is perfect. Interesting that they thought it ‘didn’t fit.’ It is a little jarring but isn’t that the point? It wakes you up. Makes you think. Keeping the innocence of children going in such ‘commercial’ times is very difficult and avoiding some confusion over Santa is often impossible. You’ve captured that adult need to be very aware of who believes in what with regard to Santa. Thank you, Sue 🙂 I had a boy in mind when I wrote it, but it could just as easily have been a girl.